We just spent a long weekend in Orlando, and our visit there was just to visit Walt Disney World’s Magic Kingdom. It’s one of my favorite places to vacation (when I’m not cruising). How does someone who loves quiet learn to love the Mouse so much? Well, it started out many years ago when we went to The Magic Kingdom on our honeymoon. It truly was a magical time, and I was hooked for life. And I’m afraid that it was contagious, because my kids are hooked too. It’s my favorite place to go to just relax and have fun, and one of the reasons is because I can ride almost everything there. Well, everything except the Tea Cups. At any other amusement park I usually sit and people watch, because I don’t do tall roller coasters, and I don’t do round and round. That’s about all there is at most amusement parks these days. So, how does a quiet cruiser deal with the crowds and noise? Well, I do have a system. We got there at rope drop when the crowds are smaller. Then, we headed down Main Street and then took off to to the left towards Adventureland while everyone else was headed to the Snow White Mine Ride and Space Mountain. It’s actually very pleasant to walk through Adventureland in the morning, with very few people around. First off was the Jungle Cruise. I timed it so that I could walk right on the boat, and before we knew it, we were listening to all the corny jokes that I never get tired of. After that we walked right onto Pirates of the Caribbean. Pirates is one of my top two favorite rides at Magic Kingdom. I love that they put Captain Jack Sparrow into the ride, not sure if I like the new “Redhead” scene at the market. Don’t change Pirates too much, Disney. After Pirates we headed over to Frontierland to ride Splash Mountain. I love Splash Mountain, and I’m still singing Zip-i-de-doo-dah in my head. Yes, it is a wonderful day! And yes, you will get wet, but that’s okay because it was hot out. And then after Splash Mountain, we went next door to Thunder Mountain to dry off. That was probably the longest line that we’d had so far, about 20 minutes, but still, the line was moving. And right after that, to my other top two ride at Magic Kingdom, Haunted Mansion. And what if a Disney loving ghost someday takes them up on it and really decides to be that 1000th ghost? That would definitely make it interesting. And now we’ve had five rides all within the first two hours of our visit to Magic Kingdom with barely a line. What now? 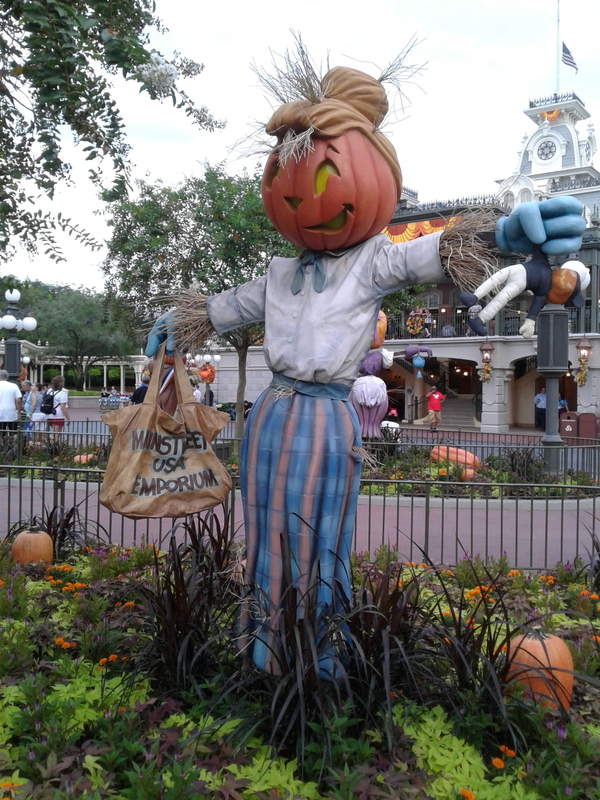 Magic Kingdom was decorated already for Halloween, so we walked around looking at all the pumpkins and scarecrows. They do have Mickey’s Not So Scary Halloween party on select nights, and for an extra charge. 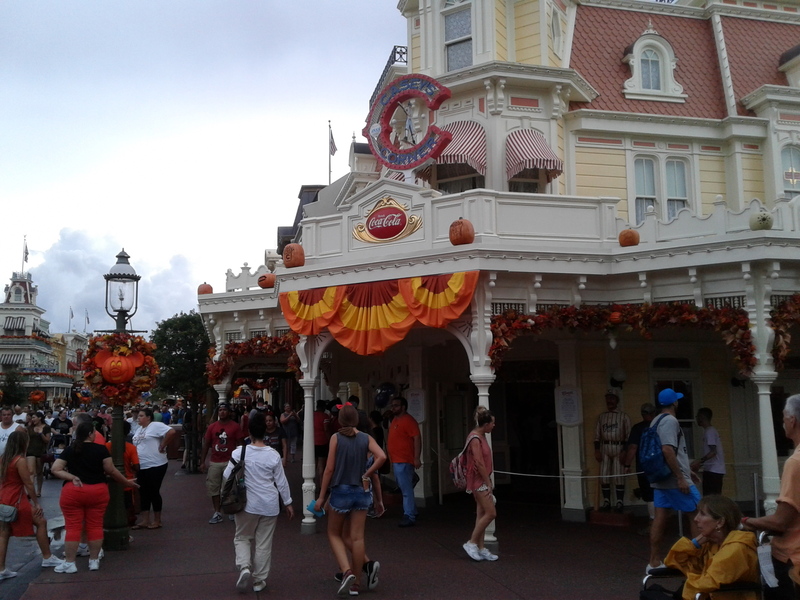 It looks like fun on the YouTube videos that I’ve watched, check out The TimTracker and Michael Kay’s videos, but the park was open till 11 pm on the day we were there with no Halloween party. And then I ran to City Hall to get some free pins. They have four different pins I believe. A Happy Birthday one, a First Visit one, a Happily Ever After one, and a Celebrating one. I got a Happily Ever after and a Celebrating one. I have a bit of a collection of them. Just ask at the counter and they’ll be happy to give you the free badge of your choice. If it’s your birthday and you get a badge early, you’ll be wished a happy birthday by cast members, and maybe you’ll get a special dessert if you eat at a sit down restaurant. So by now the crowds were really starting to pick up, after all, it was Labor Day weekend. That’s where Fast Passes come in. We headed over to Tomorrowland to ride a few rides before our Space Mountain Fast Pass took effect. It’s always pretty easy to get on Carousel of Progress so we decided to go there first. There were a few hiccups on the ride, we got stuck watching the introductory scene four times before we even started moving to the audio-animatronic figures. But after that it was smooth sailing. “It’s a great big beautiful tomorrow!” Then to the WEDWay People Mover. WED stands for Walter Elias Disney. The line was longer for the People Mover than I’ve ever seen it, but it still moved pretty quickly since it’s a continuously moving vehicle. The People Mover will take you slowly through Space Mountain and Buzz Lightyear, and around Tomorrowland. After that we finally got to ride Space Mountain with our Fast pass. I’m not the biggest fan of Space Mountain, and I think that was my last ride on it, since I didn’t feel real well afterwards. I am prone to motion sickness. It does have a lot of turns. I wasn’t sick for long, and so we decided to grab some lunch at Cosmic Ray’s Starlight Café. We were supposed to be able to order our food from the Disney World App, but we had the hardest time all day getting the app to work, and even getting the free wi-fi to work. The wi-fi was very spotty everywhere in the park. And even when I used my cell phone data, I couldn’t order food from any restaurant, it just would not work for me. We saw a few people in the pre-order lines at the restaurants, but not many, so we still had to wait in long order lines. Wish Disney would get their act together on the wi-fi and the app. It would be great if it worked right. Food was very good at Cosmic Rays, but it was very hard to find a table. And on top of that, it started raining pretty heavy outside, so everyone decided they wanted in at the same time. We managed to grab a table by a window as two women left, and we sat down to enjoy our food. He had a bacon cheeseburger and fries, and I had the barbecue sandwich. Both were good. The barbecue sandwich had plenty of meat on it, and the sauce was delicious. So, we sat there and enjoyed our lunch and watched everyone walking in the rain. By the time we were done eating, the rain was over. After that we had a Fast Pass for Buzz Lightyear. I love Buzz Lightyear, but I’m just not very good at shooting the laser gun and racking up points. I always lose, and this time was no exception. One thing that I noticed this time was that we could take a photo of the pictures they snapped on rides. It used to be that there’d be a cast member there telling you no pictures. 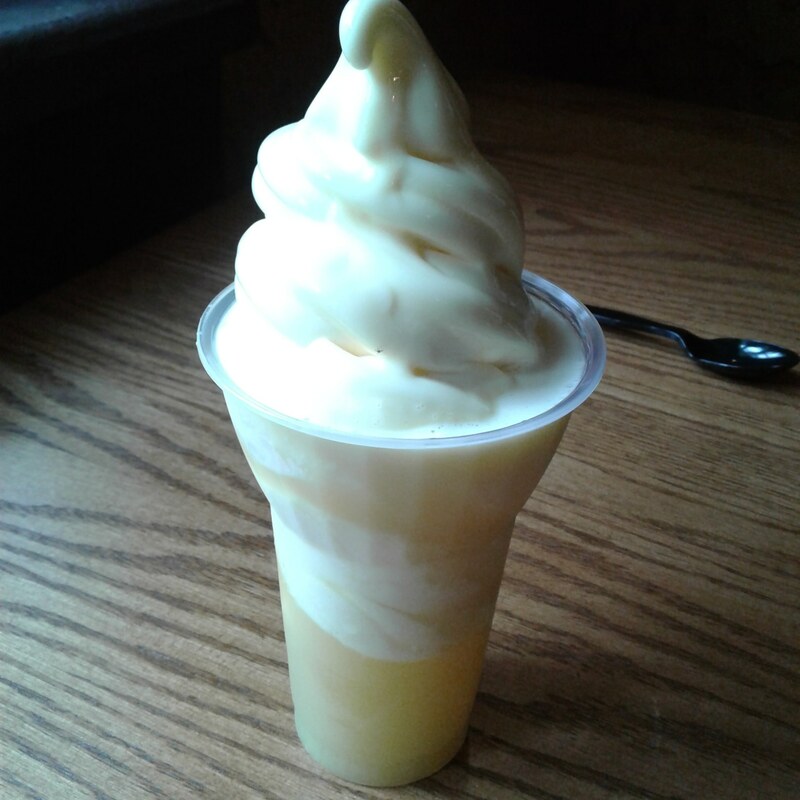 After Buzz, we roamed around a bit, it was pretty crowded and hot by now, so we decided to run over to Adventureland and get our Dole Whip Float. I couldn’t find them last time, but this time we discovered that they’ve moved them from Sunshine Tree Terrace to the Aloha Aisle, which is in Adventureland also, near the spitting camels. And again we could not order from the app, so we had to stand in line. Dole Whips are popular, but the line moved fairly quickly. It was hot out and we didn’t want to sit outside, so we ran over to Pecos Bill’s Tall Tale Inn and Café in Frontierland and found a seat by a window to relax and eat. And then it was time for our Fast Pass to Peter Pan. I love that ride but the lines are always so long, it’s a good choice for a Fast Pass. After you use up your three Fast Passes (and I recommend buying your tickets before you leave, because you can book up to 3 Fast Passes before you even get to the park. If you’re staying at a WDW property, you can book them 60 days ahead of time, and if you’re not, you can book them 30 days ahead of time. The hardest Fast Pass to get seems to be Snow White’s Mine Ride.) After you use up your three Fast Passes, you can get another. I was able to book that one on my phone app, which saved time. There are also kiosks in different areas that will allow you to book. We ended up getting a Winnie the Pooh Fast Pass this time. 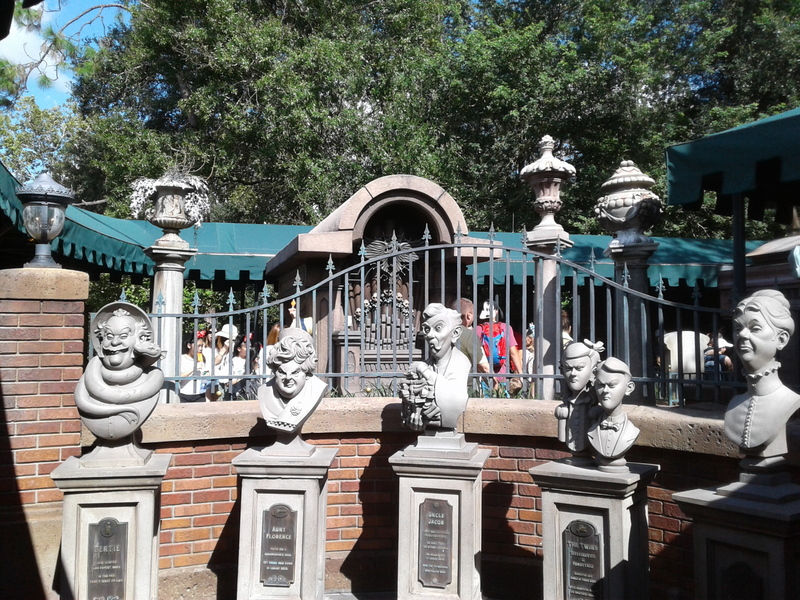 And after Winnie we got another Fast Pass to Haunted Mansion again for later in the evening. So, we made good use of our Fast Passes. I’d recommend getting your three Fast Passes for early afternoon, that way you should be able to get more later. We decided to skip the parade because that’s a good time to get in some rides with shorter lines. I needed a break so we went to Hall of Presidents. Hint: there’s never a line although you may have to wait a little while for the next show to get in. We walked right in. And it’s a great place with comfy seats to relax and close your eyes for a bit. I’ve even been known to fall asleep in there for a little catnap. For dinner we headed over to Columbia Harbour House in Liberty Square. We decided to find a table before we ordered this time. Hint: There are tables upstairs. So, we headed upstairs. The hostess had roped off a section but let us in, and it actually stayed pretty quiet up there. Very nice. He got Fish, Shrimp, and chips, and I got a Chicken pot pie. He said the fish was okay, but the pot pie was very good. It had sort of a cinnamon taste to the pie crust, actually pretty good. It came with green beans and was very filling. Then we went to the Country Bears Jamboree, and then It’s a Small World. Can’t miss those two rides. I think that the longest line that we had all day was at The Little Mermaid ride. I love that ride, so we stood there for probably 50 minutes. The line was moving very slowly and was hot in places, even though it was under a roof. The longest line in the park was probably Snow White’s Mine Ride which is a small roller coaster. We decided not to go on that ride this time. I love it, it’s cute, but it’s about a 2 ½ minute ride, and I couldn’t justify standing in line for an hour and a half. I would have gotten a Fast Pass if I could have, but they are very hard to get. We started hearing thunder and the skies were dark, so we decided to go to Mickey’s Philharmagic, which is a 3D movie starring Mickey Mouse, Donald Duck and a lot of the other Disney characters. It started raining while we were waiting in line, but we were under a roof so all was good. Mickey’s Philharmagic is a great place to take a cool break, and the kids will love it. So, after that full day it was about an hour before the Nighttime Show, Happily Ever After. And already the entire crowd was packed into the area in front of Cinderella’s Castle. I honestly think that everyone came from every other park to see it, but the show is amazing! 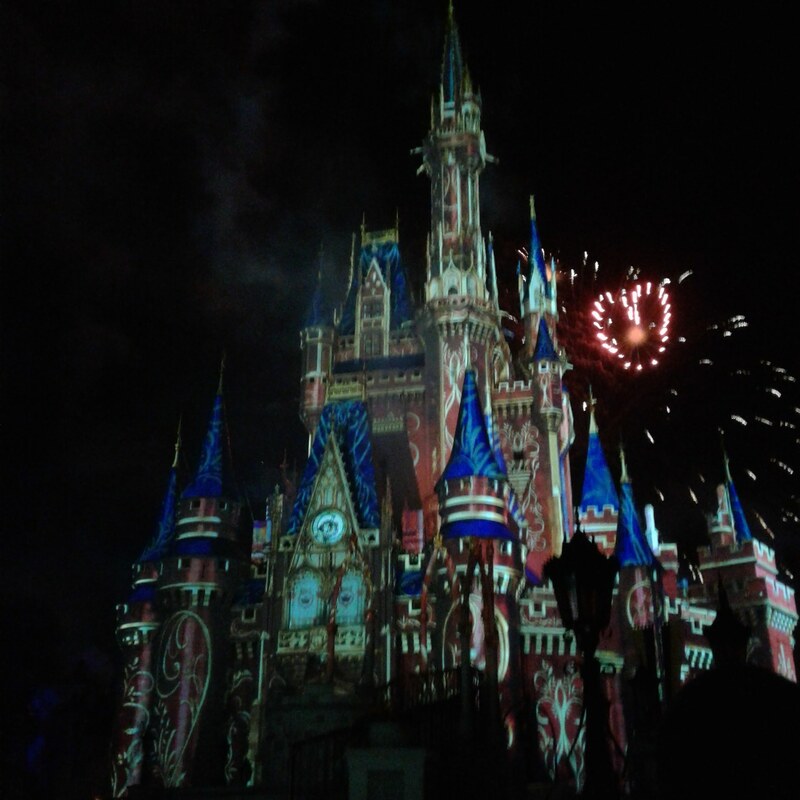 They light up the Castle somehow that makes it look like totally different buildings, and there are fireworks to boot. So, we found a place on the ground and sat down to wait it out. And then came the rain…again. We had ponchos with us and put them on, and then the park staff made everyone stand up to wait for the show. We found a place close to the Castle, and waited, and got wet, and got poked in the eye with someone’s umbrella, and it was all worth it! I have no idea on how they light up the Castle like they do, but it will blow your mind. You’ve got to see it! The Castle continually changes, along with Disney songs from different Disney movies. It’s definitely awesome. they were going slowly, so we stood there quite a while waiting to get a ferry to board. They do hold an amazing amount of people though. I was surprised to make it onboard when we did. 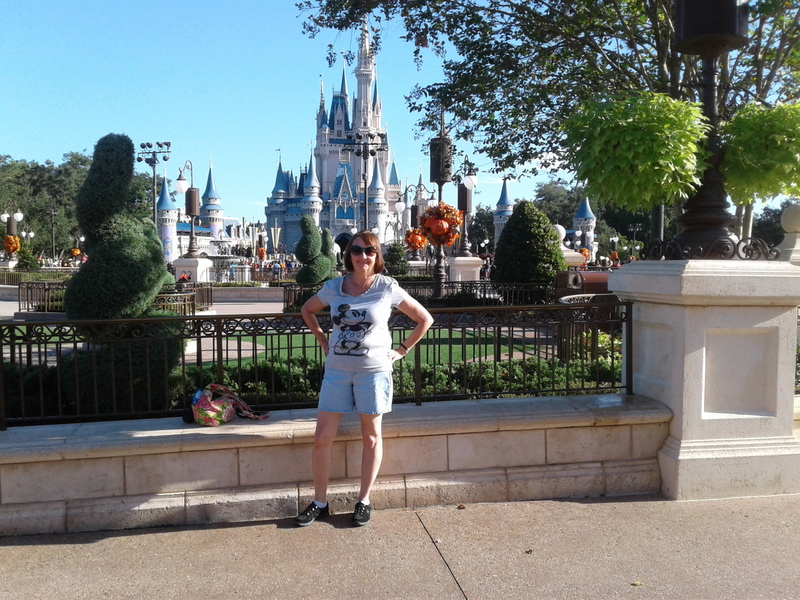 Then we had to say goodbye to The Magic Kingdom. The tram didn’t take us long to take us to Simba row 111, and the parking lot wasn’t as crowded as I’d have imagined. Driving down World Drive on our way back to our motel was confusing though, and I almost hit a car that I didn’t see beside me. Sorry. I wish that they’d label the intersections with road names, and not just the other parks. We were looking for Osceola Drive, and it was not labeled till we were right on the intersection, and we missed it. We ended up going down to route 192. We didn’t stay on property, I wish we could have but independent motels are so much less expensive. You have to watch what you get though. We stayed at the Baymont Inn & Suites on Black Lake Road. It’s a decent place for a lot less money, and very close to Animal Kingdom. By the way, parking has gone up to $22 and they don’t post that ahead of time, just at the booth. So, all in all, we had a pretty good Magic Kingdom day. We rode almost everything that we wanted to, we had some good food, and we saw a wonderful nighttime show and fireworks. 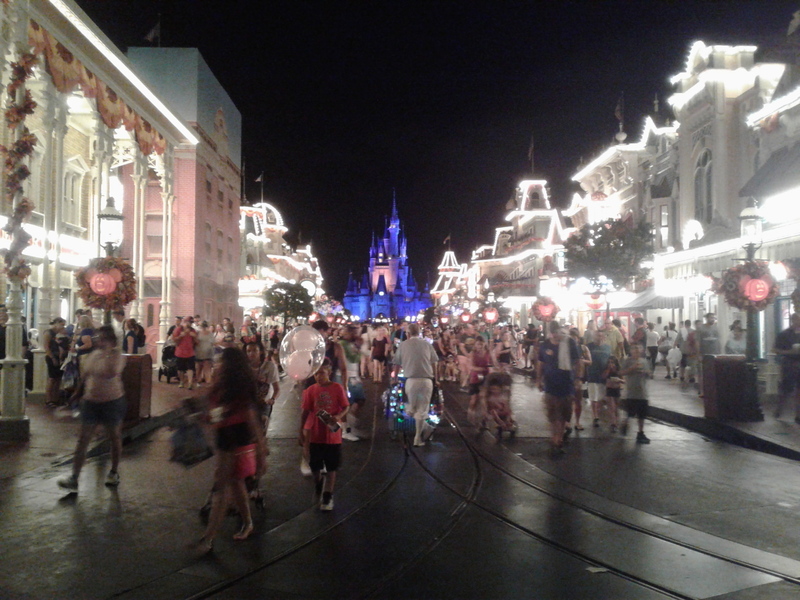 There’s just something about Disney that I love, and I can be sitting in the midst of a crowd, a crowd that would normally be too much for me, and be watching a beautiful lit up Cinderella’s Castle, and I don’t even remember that there is anyone around me. I can be sitting on a ride lost in the fantasy, and not even know that there are so many other people on the ride also. Disney is my happy place, and hopefully it won’t be too long till I’m back there again. But of course my next cruise to Aruba and Curacao will be first! This entry was posted in Uncategorized and tagged cruise blog, cruiseblog, cruising, magic kingdom, magickingdom, quietcruiser, walt disney world, waltdisney on September 8, 2018 by The Quiet Cruiser.